Why does the diet eliminate oil entirely? 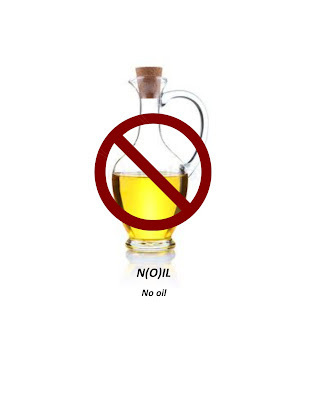 NO OIL! Not even olive oil, which goes against a lot of other advice out there about so-called good fats. The reality is that oils are extremely low in terms of nutritive value. They contain no fiber, no minerals and are 100% fat calories. And above all they contain saturated fat which immediately injures the endothelial lining of the arteries when eaten. It doesn't matter whether it's olive oil, corn oil, or any other kind of oil. You should not consume any oil...This is so important I have detailed oil in Chapter 10, "Preventing and Reversing Heart Disease" Dr. Caldwell Esselstyn. Came across this video today and just couldn't stop watching it. It's a bit long and full of information, but for those of you that aren't sure about the no dairy rule, here's something worth watching. And really watch it. Absorb it. The proteins and calcium in milk are causing a lot of harm, starting at newborns and going through old age with osteoporosis. If this doesn't convince you not to eat or drink dairy, nothing will. You can probably skip the first 10 minutes, but this is well worth the time...just find some quiet time, don't tell anyone you're watching this, but it should change the way you think about dairy. This is by Dr. John McDougall. Let me know in the comments section what you think. With the abundance of vegetables available in my garden finally here, I decided to make my favorite snack that I keep on hand in the refrigerator: Marinated Tomatoes, Cucumbers and Onions. I've made various versions of this over the year, and it's a great addition to a salad, sandwich, or just as a snack on its own. In fact, it was so warm last night that I didn't feel like cooking, so I took some previously baked baby potatoes, squashed them in a bowl, and added to them some of the marinated vegetables I've had in the refrigerator for the last week. The potatoes become a very vinegary potato salad and the tomatoes and cucumbers add a distinct flavor and texture. I think I'll call it my "Pomato Bowl"
I then add sliced tomatoes, sliced cucumbers, sliced red onions (white or yellow work as well), 5 cloves crushed or sliced garlic. Let them marinate for at least 24 hours. The longer you let them go the better. The cucumbers will taste like a combination of bread and butter pickles and dill. You can add any other vegetables as well: Carrots, Bell Peppers, jalapeño, tomatillo...be creative. Preheat the oven to 400°, and take three whole eggplants and poke a couple holes with a fork on one side of them. Place them on a cookie sheet and roast in the oven for 45 minutes to an hour. On the stove, saute the diced onion in a large, non-stick skillet. As it starts to dry out, add in the cup of wine and the garlic. After the red wine is almost evaporated, add in the crushed tomatoes, tomato paste, rosemary, red wine vinegar, lemon, Braggs amino. As this begins to thicken, add 2 cups cold water and cover the pan. When the eggplants are done, cut them in half lengthwise and scoop out the flesh. Add it to the sauce and continue cooking. When the sauce is reduce down to a nice consistency you can scoop it into a blender or food processor (or use an immersion blender), and blend it all together. Return it to the pan and taste for salt and pepper. This is just a little quick bread that I inadvertently discovered when my brother bought a 20# bag of what he thought was 100% whole wheat flour. Turns out it was 100% whole wheat, but it was a version called Atta. This is used in Indian cooking to create quick breads called Roti. It's really easy. Put the atta flour and salt in a bowl and make a well in the center. Add the water to the well and slowly mix the flour in with the water. When you have a nice dough, should be slightly tacky but makes a nice ball. Adjust the flour and water. Let it rest for about a half hour. While it's resting, get your rolling pin out and clear a place to roll Roti. If you don't have a rolling pin, use a wine bottle or vodka bottle or any other surface that you can think of. When you're ready, heat a non stick pan on the heat with no oil. Should take about three minutes. In the meantime, sprinkle your counter or cutting board with a good amount of atta flour for the rolling. Then, pull off an amount of dough to create a ball about the size of a golf ball. Roll it out, constantly turning it, until it's about 1/4 to 1/8 inch thick. You may need to keep putting flour on the dough and surface to keep from sticking. When you're ready, place the roti (doesn't have to be a perfect circle) in the hot pan. Turn it after 30 seconds. It's really easy to just flip it if you're daring enough. Cook for another 30 seconds, then flip it onto the hot burner and it will puff up like a balloon. Have some tongs ready to immediately remove it. You can use this for a wrap, for dips like hummus, or just eat as is. Quick, easy and healthy. Why should I change? My health is excellent. We will all die...that's our only guarantee in life. How we die, that we have a little control over. Dr. Esselstyn did an interview with CNN that will easily explain the complexities that he expands upon in his book. If you don't want to read the book, which I highly recommend, at least read this article. No one escapes in the end--eventually the traditional western diet guarantees some form of disease in all of us. While it may not be heart disease at the moment, eventually it will be or hypertension, diabetes, stroke,obesity, gall stones, diverticulitis, rheumatoid arthritis, lupus, multiple sclerosis, or a greater likelihood of breast, prostate, colon, ovarian and uterine cancers. Even erectile dysfunction and dementia. The world famous Framingham Heart Study now approaching its 60th year looked at 1,000 people at age 50 who had normal blood pressure. They looked at the same group at age 70, and 90% now had high blood pressure. But there is something that you can do now to stop the cascading events that occur in the body and lead to disease. You can change your diet and begin safeguarding your health for the future. Remember when you were a kid and your mom put these nasty purple circles on your plate and told you to eat them "they're good for you"? Much like many other vegetables from our childhood, almost everything came already cooked or marinated in a can or jar. Remember how tasty asparagus used to be...those slimy light green wormy like things that were also "good for you"? Well, now you've grown up. Things that you were forced to eat as a child are still around, but now there are options. Broccoli, peas and carrots, asparagus, spinach, lima beans, string beans, butter beans, and the list goes on. All of these things taste like a new revolution in food when they are prepared properly, and you should take the time to find new things to eat that you used to hate. 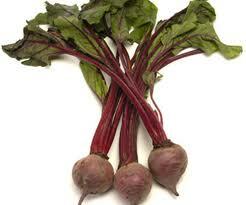 That's where BEETS come in. I have slipped them into meals where people had no idea that they were eating them, (low lighting helps) especially the gold ones since most people have never heard of them. When people can't dissect what they're eating and attribute a childhood memory to what they perceive it will taste like, they've been pleasantly surprised. Believe it or not, beets do not always come pickled. You can buy them pinkish red, golden, or purple. You can boil, steam, roast, or even cut them up raw for a salad, and remember to use them in soups, juices or, if you're memory differs than mine, eat them pickled. The greens are delicious as well and all of them are good for you...lots of vitamins (high in folate, which is good for cell reproduction, big source of vitamin C, also A, B1, B2 and B6, calcium, magnesium, copper, phosphorus, sodium and a great source of iron. 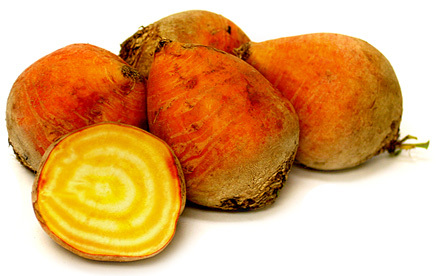 There are so many health benefits to beets that you'll just have to Google them to see. I made some last night using my preferred method of wrapping individually in aluminum foil and roasting in a 400 degree oven for 35-40 minutes. Don't overcook them as they will lose their amazing health benefits. I cut mine up and had them with a homegrown tomato, sea salt, freshly ground pepper and balsamic vinegar. So good in fact, I think I'll have them again tonight. Make sure you clean them well as they can be a little sandy. It's not necessary to peel them, just give a good scrub and eat them skin on. In my discovery of this new plant based eating plan, I have found that there are certain things that I really like to keep in my pantry and larder (cold place ie. fridge, freezer, cool place). I can always come up with a meal if I have these things readily available to me. Some of the things in this list you'll be familiar with, others you'll want to familiarize yourself with. It's all a learning curve...and if you can think of any important items I'm missing, please post in the Comments Section as we're all teaching and learning at the same time. Use this as a checklist for what you already have, and take it to the store for those things you need. I'm sure I will be adding to this in the future. I already had a pretty extensive pantry, but these are some things that I think will get anyone in a plant strong eating regimen on their way. There were a lot of leftovers this week from multiple dinner parties, vegan of course, last week. I had a really big bag of fresh baby spinach, mashed potatoes, fresh dill, tomatoes, quinoa, and carrots for leftovers. So the challenge was to come up with something for dinner using the leftovers and things I had in my pantry. I added in some frozen tofu that I thawed and cut into one inch pieces, a rinsed can of chickpeas, braggs amino, garam masala Indian spice, no chicken chicken stock, red bell pepper, arrowroot and water slurry (for thickener). Added everything together and served over the quinoa. One of the great things about a plant based diet is so much of the food you buy is fresh and doesn't have any preservatives. This also creates a need to constantly clean out the refrigerator. I do this for at least one, maybe two meals a week. I take all the things I need to use quickly and see how I can combine them to make my "leftover bowl". I like to cook things like beans, rice, quinoa, sauces and vegetable stock in larger quantities so I can freeze them and always have them available for a quick "I don't feel like thinking about cooking, let alone cooking" meals. The mayo from my recipe section doesn't last all that long (and you should stir it before using as the liquid on top doesn't mean it's bad), maybe about a week and a half. The good news is it makes great sandwich spreads and salad dressings. Add a little ketchup for Russian dressing, or ketchup and pickle relish for Thousand Islands. In this bowl I took a couple cups of raw spinach, a handful (big) of romaine lettuce, some leftover quinoa (from the freezer), some of the beans I made last week, the stuffing I had leftover from my tamales, picked that day tomatoes, corn from my last ear of roasted corn in Saturday's meal, crisped up oven baked tortillas and I added Cholula sauce to my last 1/2 cup of mayo and created my Monday Leftover Bowl. Would love to see pictures and hear about the unique ingredients you use to make a leftover bowl. I used this recipe for Maple Banana Bread from the cookbook of "The Everyday Vegan" I didn't add the dairy free chocolate chips as I'm just a Banana Bread Purist. I may add other things when I make this again, however, I always like to stick to the original recipe the first time before I start my "I bet it would taste good if I added......." This is a great way to use those last two bananas (which, if they're normal sized bananas, is about the exact amount to make a cup) before they go completely inedible. You can throw them in the fridge or freezer and use them when you're ready. Preheat oven to 350. In a large bowl, mix dry ingredients. In a separate bowl, combine mashed banana, maple syrup, soy milk, and vanilla. Add wet mixture to dry (and chocolate chips, if using), and stir through until just well combined (don't overmix). Wipe a loaf pan lightly with oil or baking spray (you can also get silicon bread and/or muffin pans that are no stick). Pour batter into pan and bake for 43-48 minutes, until golden and a toothpick or skewer inserted in the center comes out clean. Let it cool completely before slicing. I love this recipe and so did all of the people I made it for. This was always my favorite way to eat eggs, so I had to come up with a Vegan version. Take some corn tortillas and brown them on your burner or in a non stick pan...this just gives them some flavor and cooks out the raw taste of the tortillas. I also like to soak them in a red enchilada sauce for extra flavor. Look for one without oil. I found one by Chef Rick Bayless manufactured under the name Frontera. Use a package of Non GMO tofu, any kind you have around. Made tamales the other day with no fat, which is no easy feat when you're dealing with the masa harina (a type of corn flour) dough. Had a bunch of the filling left over so the next night I turned it into tacos. Using my brothers link that he posted for mashed potato tacos, I added the twist of my fillings for a delicious meal. The side salad on the last photo is like the go to rice dish on an earlier blog but using quinoa (which contains all 9 essential aminos) instead of brown rice. The first picture is my chicken(ish) with green sauce, second is beef(ish) with red sauce. Add some fresh garden tomatoes to and salsa to the mashed potato tacos and you've got yourself one great Mexican Fiesta, delicioso! So, the recipe for the dish in the previous blog is as follows. Make some mashed potatoes. I used Yukon gold potatoes, almond milk, granulated garlic, granulated onion, salt and pepper. Brown the Mushrooms and Onions until soft. Add the garlic and continue to brown. Add the tomato past, tarragon, rosemary and vegetable stock. After it is reduced down by half, add the chicken seitan and cook until warm. Serve over your mashed potatoes. Chicken and Mushroom Stroganoff served over mashed potatoes with steamed broccoli and lemon juice. Recipe will be in the recipe section tomorrow. Also added Homegrown Haas Avocado and Homegrown Basil. Really Good! I have been asked to blog about breakfast ideas. I know I've touched on them in other blogs, but more about it here. This next recipe comes from Rip Esselstyn's Engine 2 Diet with my spin. This is FRENCH TOAST. Take a whole banana and crush it (use the food processor or blender for speed) with 1 1/12 cups of almond milk, a sprinkling of cinnamon, 3/4 tsp real vanilla extract, and a couple grates of nutmeg. You just want a creamy consistency. Heat a non stick pan until it's very hot and a drop of water dances on it. Remember, no oil. Take thick slices of whole grain bread and quickly dip each side in the batter mixture. Cook in the pan about 2 minutes on each side. Serve with Maple syrup and you'll never miss the egg and milk french toast again. I love this recipe and so did all of the people I made it for. This was always my favorite way to eat eggs, so I had to come up with a Vegan version. Take some corn tortillas and brown them on your burner or in a non stick pan...this just gives them some flavor and cooks out the raw taste of the tortillas. It's summer so to beat the heat, use your barbecue! What can be more American than burgers and baked beans. Slice whole potatoes and sprinkle with Sea Salt and Black Pepper. You can also add minced garlic and any kind of herbs you like for variety. Wrap the potatoes in aluminum foil and put them over the hot coals or right on your grill rack. They will take about 45 minutes so start these first. YIKES, there's a lot to learn. Complete protein, incomplete protein, essential amino acid...there's a lot to learn doing this Vegan thing. I'm still trying to wrap my head around all of the information that's available. And the opinions are wide and varied. Many people believe that with a plant based diet you can't get enough of the things you need to survive and thrive. How much protein do we need; how can you get protein from this nutrition plan; do I really have to food combine to get all of the minerals I need....and on and on. If you don't want to do braggs amino, start out with a teaspoon of sea salt and do it to taste from there. One of the things people ask me about all the time is how you deal with the "gassiness" of this nutritional program? Fair question, and I know the "feeling". Let's face it, our bodies aren't used to an oil free, plant based diet. We're used to focusing our meals around fatty meats, cheese, white starches (as in pasta and rice), and keeping the grains, veggies, and legumes on the "side dish" portion of the plate. I read an article recently where someone inquired about the change that would take place in our digestive system when we switched to a totally plant based diet. As one possible cause for the discomfort someone suggested that the enzymes created in our intestines to break down the food would change since they were so used to the onslaught of fats, oils and sugars. I'm introducing a new page called Gadgets & Tools and you can access it on the right side of the page under the heading. There are a lot of things out there for the home cook to make life easier. Many just take up space. I'm going try and introduce things here that you will not only love but that will become so useful in your kitchen you wonder how you lived without them. The first item is something we came across in Bed Bath and Beyond. Wasn't looking for it, but since it was at the end of an aisle AND it said "As Seen on TV", had to check it out. It's a device by Mastrad and in 3 to 4 minutes in your microwave, you will have the best tasting chips you've ever eaten. It's $20 and worth every penny. I LOVE potato chips, so to have an oil free way of making them is awesome. As if that's not enough, it comes with a miniature mandoline so that you can slice your potatoes to the perfect thickness. I slice the potatoes and them soak them in white vinegar (or any other kind...experiment). Right before I put them in the micro, sprinkle a little sea salt on them and you'll have fat free salt and vinegar chips. The downside to this is that since they don't have any preservatives they will get soggy fairly quickly so you have to eat them kind of quickly. The upside is you have to eat them kind of quickly. You can also go directly to their website and order more levels of the device so you can make more chips at once. A couple people asked me how to post a comment to my blog as it says you must have a Google account. In an effort to keep people from spamming bloggers, google wants you to verify yourself. This does not mean you need a gmail address. You can set up an account and your own google password (don't use your email password for this. Create a new one). All you have to do is go to a google sign in page and click on the sign up link. Follow the instructions and it will send an email to your current email account so you can click on a link to verify yourself. If you're one of those people that find the above instruction too easy, here's a link that's more spelled out for you. Eat plant strong this summer! Home farmers are coming into the peek harvest time of the summer. If you're not growing your own veggies, bug your neighbors and family. chances are they can't eat all that they grow. I LOVE tomatoes this time of year. Can't get enough of them. I planted 31 heirloom and this is my best garden in years. Couple of things about tomatoes. Never put them in the refrigerator. Keep them in a cool spot in the kitchen. They chemically lose their flavor in the fridge (Don't believe it? Google it). You can go through the therapeutic process of canning the tomatoes to preserve the summer....or, now write this down. Open a large freezer ziploc bag, place several whole tomatoes in the bag and freeze them. They won't slice well for sandwiches, but you don't put canned tomatoes on sandwiches anyway. When thawed, grate them on a box grater over a bowl and enjoy great, fresh tomato sauce. I can't get enough fresh tomatoes. As you may have seen in my food pics, I love tomatoes, basil and avocados on whole wheat toast for breakfast. Or a tomato sandwich with basil and vegan mayo (the oil free version under recipes on the blog). Chop up some tomatoes, basil, fresh garlic, balsamic vinegar and a little sea salt with a lot of cracked pepper on toasted whole wheat baguettes...great appetizer. Feel free to post any ideas you have for using summer vegetables. One of the most requested things I make is my summer ratatouille. So, as I'm know to do, I through this together last night and it was incredible. And as many who know me say, "what's the recipe"? Well, since I made it up I'll attempt to re-create this for my blog.